After finishing my Lucky Square, I decided that I should spend the rest of April finishing up loose ends on other projects. So I pulled out all of the blocks for my Argyle quilt and laid the whole thing out. It did take a while to make sure that it looked "random" enough. There really needs to be an app for randomizing blocks like yesterday. I did all of the setting triangles next. Note: this was a royal pain because it wasn't right angles. I didnt' really measure them either. I kind of just sewed them and squared them up and then added the next row. Totally janky, but I got it done!!! Last night I put the last few stitches in the binding and I got pictures this morning before I left for work! I can see lots of little imperfections, but I love this one because it's my work start to finish. Size: Throw, approximately 58" by 68"
Sharing at Fiber of All Sorts/Sew Bittersweet Designs for A Lovely Year Of Finishes and Crazy Mom Quilts for Finish It up Friday! 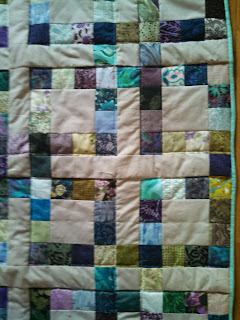 I started hand stitching the binding on my Lucky Square quilt and made a fair amount of progress! Whoo! I'm just under half way done with this one and should be able to get a lot more done on it tonight. I also started working on another gemstone block in "citrine" colors except I didn't think to snap a picture before I left for work this morning. When I get home I'll try to remember to add it! You can get the pattern from No Hats in the House. 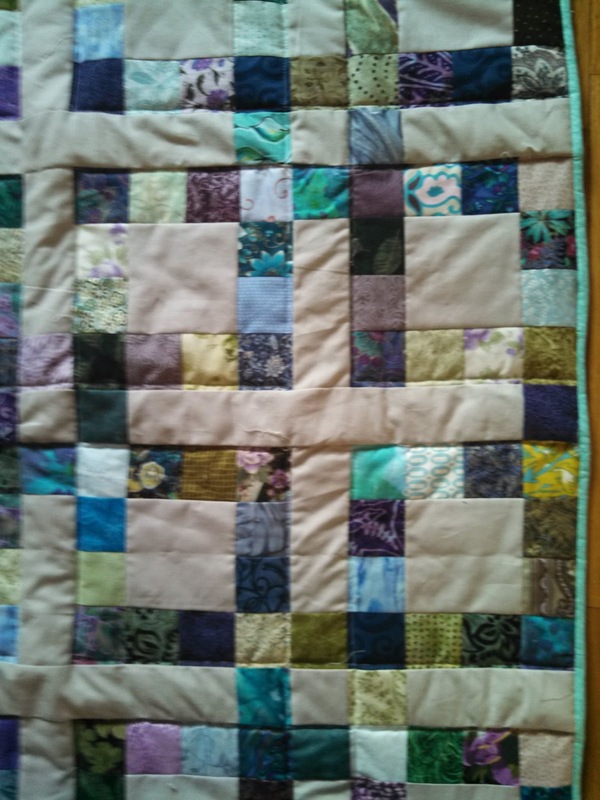 Update: here is the picture of the finished block! Hooray! 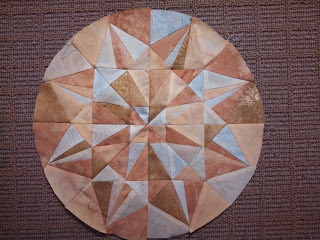 Check out what everyone else is up to today at WIP Wednesday at Freshly Pieced! I dove right into this because, let's face it, I'm a paper piecing junkie. I started working on my Round Birthstone Block from No Hats in the House. AND IT LOOKS AMAZING! I decided to not make large blocks (the directions tell you how to make different sizes based on how you enlarge/shrink the pattern) and make the 12 inch blocks. You end up making 8 wedges so I printed two per page. The next one I make, I promise to take more pictures. I was never interested in modern/improvisational piecing until more recently and I am in LOVE with these trees! I also LOVE bumblebees. 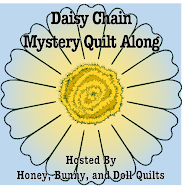 This pattern was designed as the label for a row along quilt, but I would love to make a baby quilt of all bumblebees! How cool is this block? WAY COOL. 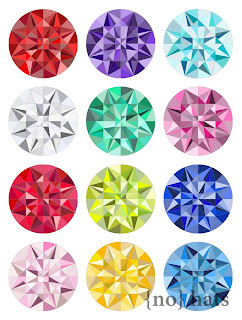 I already got a copy of this one and I can't wait to start making some beauties! 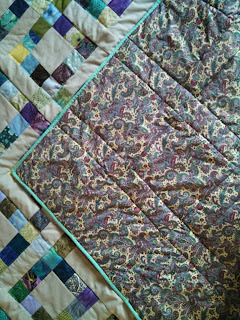 And here's my quilt board if you need more quilty inspiration. Happy Sunday! I took a chance and tried out this fusible batting to use with my Lucky Squares quilt. The directions are simple and it worked fairly well! 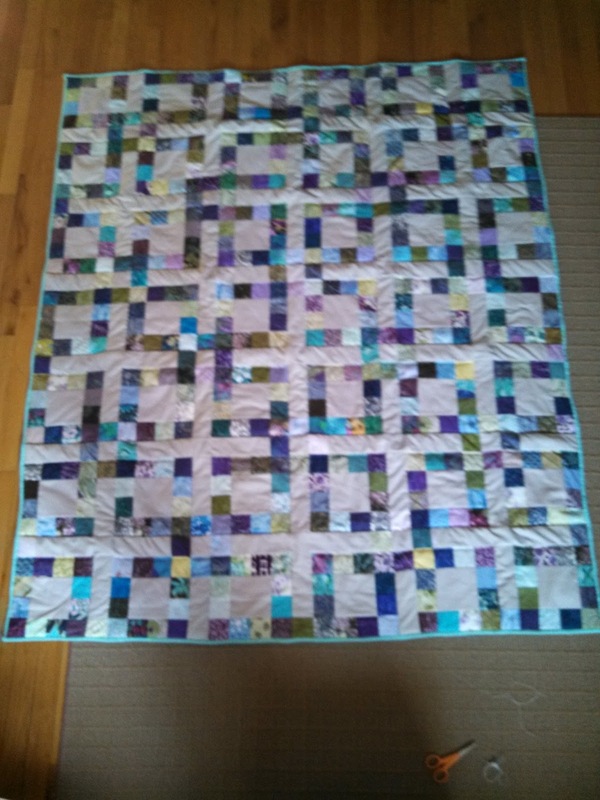 I did have a little bit of trouble because I started the quilting and then had to take it out and re-adhere the quilt top, backing, and batting. 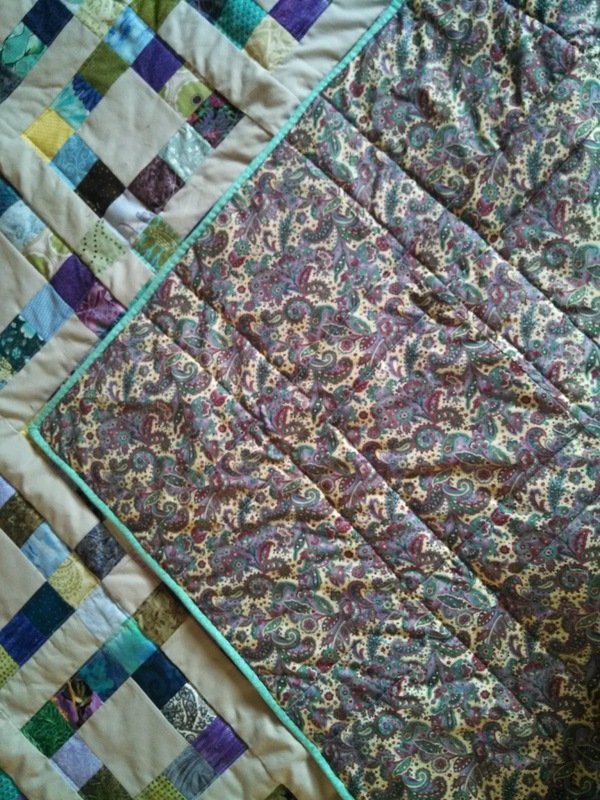 Today I did the machine quilting of the entire top with my walking foot! It went so much quicker than I had expected and I even got the binding sewn on the front so I can start working on the hand stitching while I watch some Netflix tonight. Yesterday I got my April Fat Quarter Friends Swap package from my partner!! The leftmost fabric looks like a panel with some sassy ladies on it! 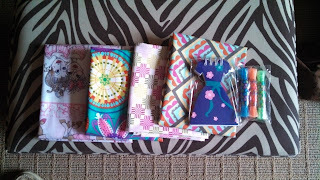 I am pretty sure that I have some half yards of fabric that coordinate with the rightmost fabric. Woo hoo! Happy Friday, and here's to getting some ACTUAL sewing done this weekend! I was lucky enough to be chosen as one of the winners for March in the Lovely Year of Finishes! I won a $15 gift certificate to Contemporary Cloth! I was shocked and so excited! I decided to treat myself and get a jelly roll of Architextures, because I've been loving all of the projects that everyone else has been making with this line! It arrived last night and it will be continuously ogled until I decide on a project for it. I might just leave it on my end table until then because it is so pretty. Since I didn't make it out to get a batting or spray adhesive, I worked on making some more scrappy baskets for my stash. 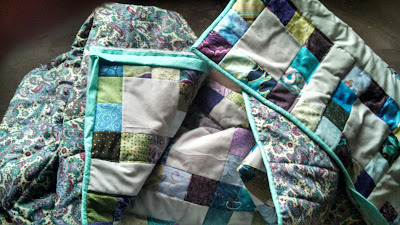 Still no plan on what exactly to do with them, but I think I might make a few baby quilts out of them. Good luck on your new week! This month, I want to finish my Lucky Squares quilt. I am going to attempt to machine quilt it myself with my walking foot. I think. I did already get backing for this one, so I just need a batting! And a lot of patience. Wish me luck! Check out what everyone else is working on this month! 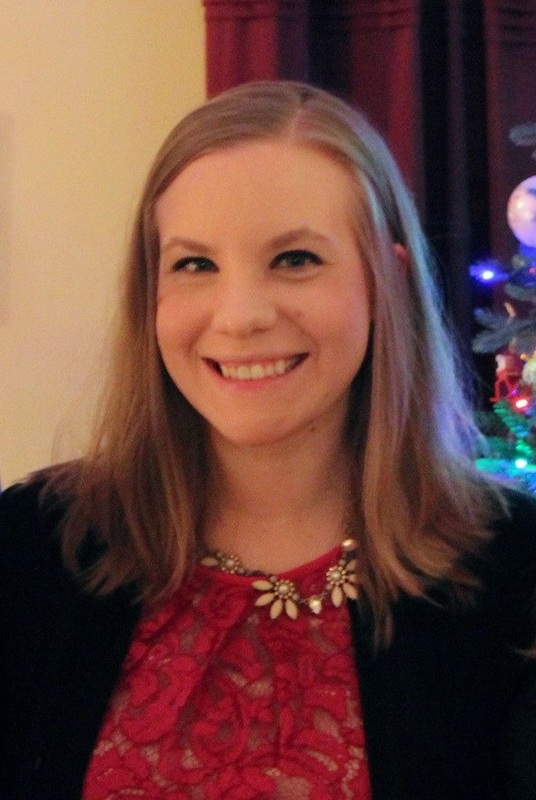 This month, our blocks are going to Carol of Fun Threads, who is also the head hive mama for our hive! She also chose the same block as Kelsey from last month, except in red, green, and white. It was (again!) 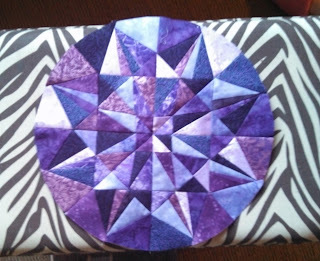 a fun block to make and it will look really cool once the blocks are all together. I also sent off my Fat Quarter Friends Swap package for the month to my partner! Hopefully she likes what I sent her! 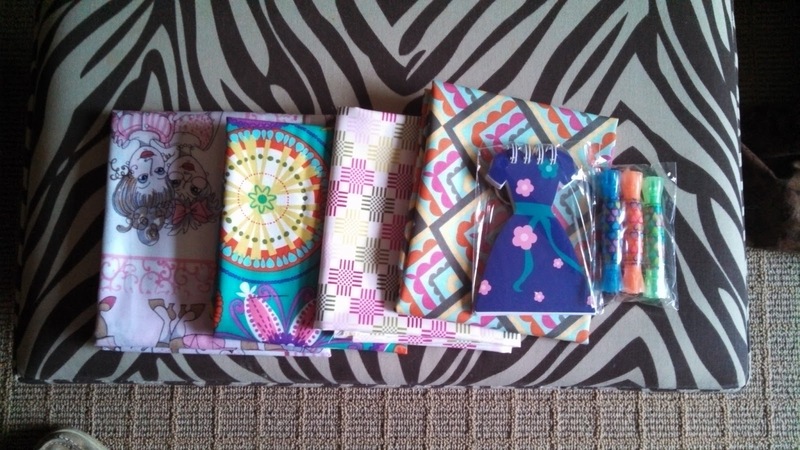 I think any new fabric is always fun, so I'm excited to get anything!